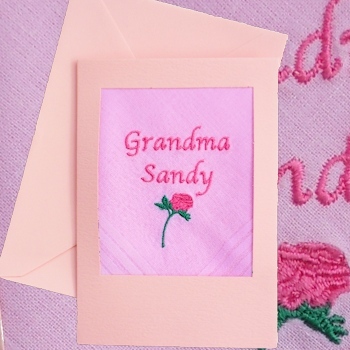 Ladies pink cotton 28cm handkerchief that is embroidered with a name or little message and a lovely rose motif in dark pink thread. The card has a open window where the hanky is folded in place and enclosed when you open the card. The card has a open window where the hanky is folded in place and enclosed when you open the card. The card is blank on the inside for you to write your greeting. Card comes with matching pink envelope and measures approx. 14x10cm. Please fill in the name or words you want embroidered... Maybe a simple message such as Happy Birthday, Thank you, or 2nd Anniversary instead of a name!